Scrambled States Game – Educational and Fun! Scrambled States is a great game which is a lot of fun and helps kids learn all about United States geography. We have owned this game for about 6 years and it has been played so many times. 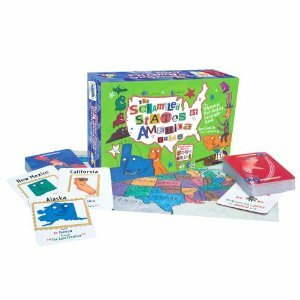 The Scrambled States of America Game helps children learn the names, capitals, nicknames, shapes and positions of the states. This is one of those great activities where children learn so much without even knowing that this is helping them so much with what they need to know for school. This game appeals to children from age 5 and up (although the product is classified as being from age 8 and up). My 2 boys aged 6 and 10 love playing it! There is a great incentive to learn because the more you know the better chance you have to win! Certainly for our gamily it has been the easiest way for all the children to learn about US states geography. At just $13.60 it is a great price on Amazon where it gets 5 Stars will almost 80 reviews. Finulite Cellulite Reduction at 50% Off Discount!